A large, deadly landslide in northern Washington has been making news. Smaller ones around here aren’t deadly, thank goodness, but they are sneaky and expensive and everywhere. 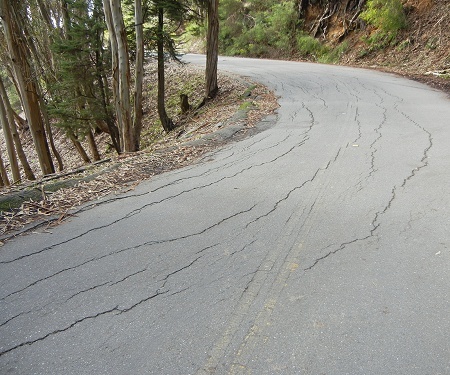 This isn’t a landslide yet, but these concentric cracks in Skyline Boulevard are typical signs of slumping ground. A city with more money to maintain streets would have dribbled tar over these cracks when they first appeared, a year or two ago. As it is, each crack lets rainwater into the hillside where it promotes more slumping. Keeping the road sealed will buy a few years’ time. This location is underlain by the same incompetent Sobrante Formation that gave the Caldecott Tunnel builders such trouble. But landslides occur in Oakland on nearly every geologic unit, from the lower streambanks to the highest hills. This entry was posted on 26 March 2014 at 4:53 pm and is filed under Landslides. You can follow any responses to this entry through the RSS 2.0 feed. You can skip to the end and leave a response. Pinging is currently not allowed. There was a slide that closed off Brunell drive through to Crestmont. It was never reopened. The big problem in places like that isn’t so much the cracks in the road, but the unlined drainage along the uphill side which collects water and feeds it right to the sliver fill the road is on.